Benchmarks/PFCP is supporting several community-level projects which address the root causes of economic disparities and poorer health within a community-wide structure, convening partners from across currently-siloed systems (education, human services, healthcare, public safety, child welfare, early intervention) to realign resources towards creating opportunity for prosperity within the community. There has never been a question as to whether focusing on prevention was the right, and most effective, course of action. The question has always been, instead, who has the time to do this? Benchmarks is taking a leadership role to begin the work of addressing these complex social problems as treatable conditions. As a non-profit association outside of the healthcare/human services/government/education funding streams, Benchmarks is an ideal convener of these typically-siloed interventions. c. There is a comprehensive array of community-based services providers who are interested in partnering for success. Benchmarks/PFCP will provide leadership by serving as a resource for national best practices for interventions designed to improve community prosperity, by promoting effective state and federal policy, and by working with public and private payers to support improved population health and prosperity. Health begins where we live, learn, work and play. The time has come to stop thinking of health care as simply what happens at the doctor’s office.Our health is impacted by what is happening in our families, in our schools and workplaces, in our playgrounds and parks, and in our neighborhoods and communities. The conditions in which we live and work directly and profoundly impact our health, long before we ever see a doctor. The more we understand health this way, the more opportunities we have to improve it. According to research conducted by the Kaiser Family Foundation, health care accounts for only 10% of a person’s overall health. Social and environmental factors, combined with individual behaviors have a much higher impact, which are, in turn, impacted by where we live. We also know that outcomes worsen as economic disparities become more sever. In 2016, Benchmarks began its Partnering for Community Prosperity initiative to refocus our finite community resources to invest in prevention to change the way we conceptualize healthcare. Understanding this becomes even more important in a managed care environment, where value-based payments are the increasingly the norm. 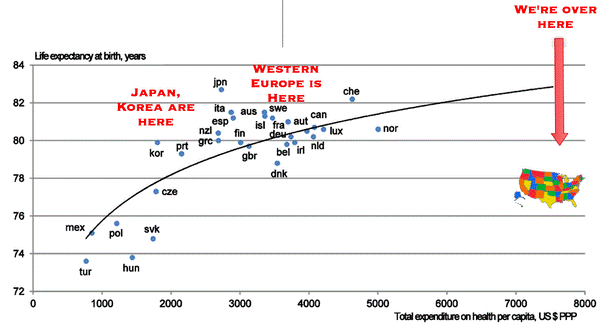 The fee for service model for healthcare employed in the United States is not creating value in terms of spending (which far exceeds most developed countries) or in terms of life expectancy (which lags behind most developed countries). 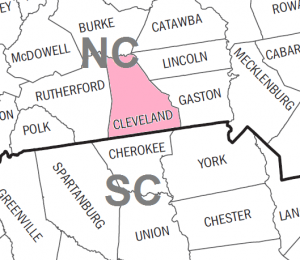 North Carolina’s shift towards private managed care mirrors national conversations in healthcare. 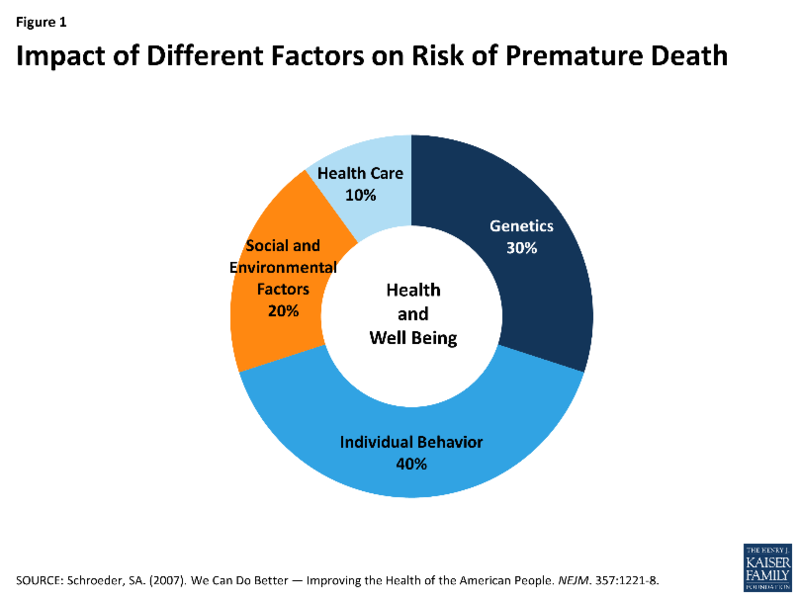 Increasingly, we understand health and population health as separate from what happens in our doctors’ offices and hospitals. Shifting our funding away from the fee-for-service system that has dominated healthcare spending, towards more flexible spending to optimize population health will reduce costs for insurers, for government and for taxpayers, and redirect resources towards health outcomes. 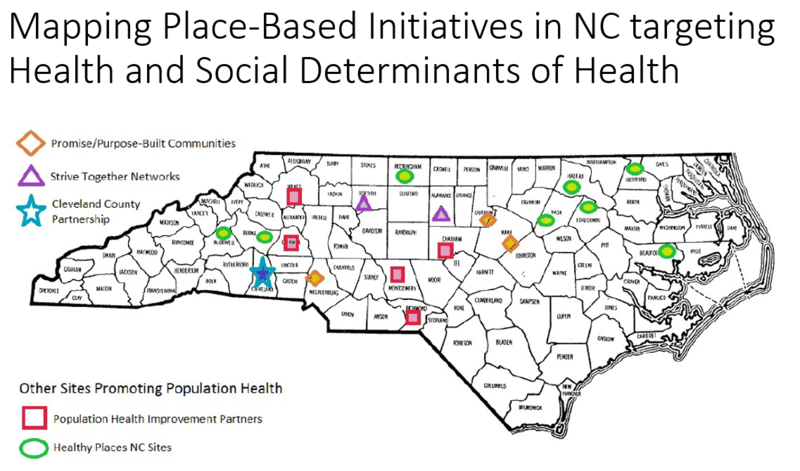 Over the past 18 months, we have researched and spoken with community leaders, foundations, and local officials about place-based work being developed across NC and nationally. This has given us knowledge about the key features of upstream, collaborative approaches to addressing social determinants of health, under education, housing, and health and wellness frameworks. As local stakeholders identify their key priorities, Benchmarks is therefore able to make connections to and help bring in resources from other similar initiatives around the state that align with the strengths, needs and will of the community. Through our research, we have developed a database of community-driven resources and technical support providers across the state who are supporting this kind of work. While there are differences from community to community and funder to funder, they tend to fall into one of three categories—Affordable, Safe Housing; Education; and Health & Wellness. The following map shows some of the breadth of initiatives currently underway. Benchmarks is supporting collaborative teams in multiple communities to develop a community-wide, cross-functional approach that rebraids multiple systems for better health outcomes and reduced public expenditures by targeting social determinants of health. Higher than average rates of crime and unemployment. Despite being a mostly rural county of about 100,000, there are areas—focused around two elementary school districts—that are dealing with disproportionate rates of poverty, crime, unemployment, and substance use. Through this community-level work, we are engaging communities in collaborative approaches to take ownership and support long-term health and prosperity.